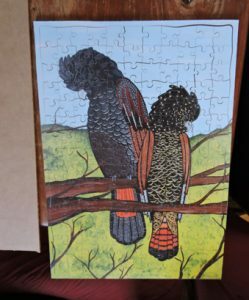 Currently – as at September, 2018, we are making all our puzzles in 3mm MDF Timber, at standard A4 or A3 size final sizes. So at 42cms x 29.7cms, the jigsaws are not large . . . BUT we are very high quality saw cutters, and as a result we can create not just beautiful and timeless jigsaws, but also fairly testing challenges. 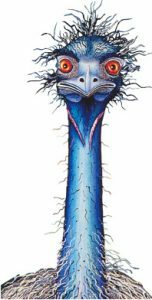 Whilst the longest challenge may be 4 to 6 hours for a puzzler of adequate skill, (maybe 3 hours for the advanced aficionado). Yet when we considered the restraints on time and focus in today’s hectic existence, we actually found that for many – this is exactly what they were after. So if you like difficult, but without the several days or weeks that many challenges involve. 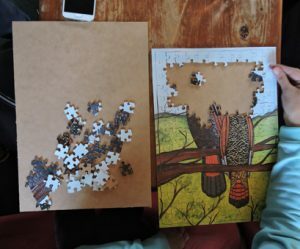 Then the Plato Puzzles adult wooden puzzles make an excellent choice. Also the difficulty level is spot on for school ages 12 to 18. Whether in primary or high school, the range of harder puzzles fit both the space constraints and the time allocation ideal for pupils of these ages. All puzzles include a rear information sheet about the artist, the artwork and the culture that underpins it. Selected examples of the 176 piece tray puzzles . . . It took exactly 92 minutes for what I would call a “darn fine” puzzler, (no folks – not me) to finish. Here are some action shots . . . So needless to say, enormous fun was had by all!! The puzzler felt like she was a victim of paparazzi the way I hassled her through-out the challenge!! Ahhh good times . 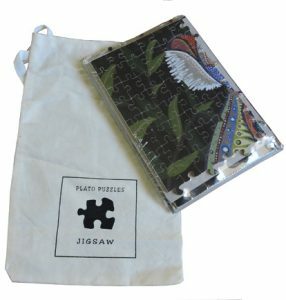 . .
All puzzles are packaged in the calico “swag bag” and include an A4 size “map” to build the jigsaw and a information card about the artist, the artwork and the culture that underpins it. 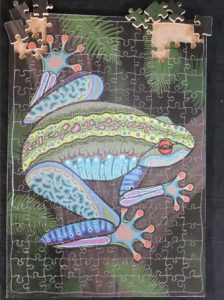 I am a serious puzzler interested in art puzzles, from around the world. Artists like Jacek Yerka, Tinga Tinga and many more who are alone in their field. I have been to Australia and realised that my art collection is missing wonderful Aborigine drawings. 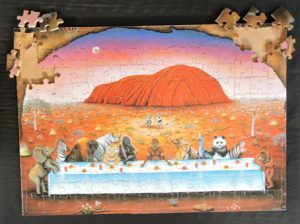 I found sites on internet and am disappointed that there are no 1000 piece puzzles to be found. Do you have any in stock or could you point me in the right direction. Well we feature the famed indigenous artist Robert Campbell jnr, (1944-1993) of the Ngaku Tribe, which would make a valuable addition to your artistic puzzles with provenance. But I also enjoy our other indigenous Murri and Koori works. 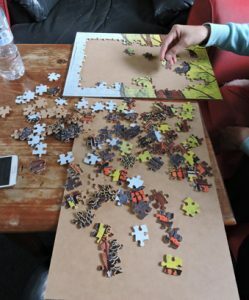 But toanswer your question, no we don’t have bigger 1000 piece puzzles currently as everything is now not mass produced cardboard puzzles, but rather wooden ones, so we are just getting used to that. 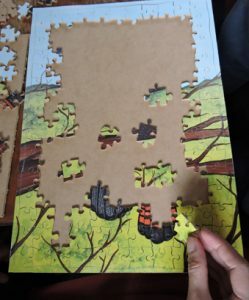 But we are getting larger puzzles going this year. All our catalog will become available in larger sizes, 500, 750 & 1000, although there will of course be some freight costs, but we only charge what we pay for the freight. So the upshot is hold tight and I will notify you via email when the larger sizes are available. Thank you for your prompt reply. I am looking forward to the 1000 piece puzzles. I think the puzzles you have are fantastic but I also like the challenge of a larger puzzle. 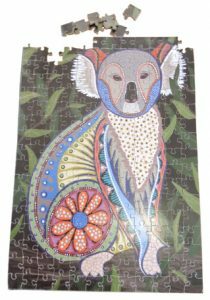 In case you didn’t receive my answer just want to say I am delighted that there will be a selection of 1000 piece puzzles soon. I forgot to mention that when you do manufacture 1000 pieces etc could you keep to the standard size 70cm X 50cm. This makes it easier to find frames – I use frames from IKEA, reasonably priced, perfect size and light weight. Yes I am hoping I will have the 1000 pieces ready to go by the end of the month. But jokes aside what image would you like to see in the 1000 pieces? So glad you are using those measurements! My favourite painting is Hunter and Tucker by Robert Campbell. I also love the fact that you include information about the painting which is not always the case. One usually has to do research on the net to find out more about the artists and their work. Definitely also one of my favorites!! A bit of everything Australian in there!! I’ll make sure I saw up one of those for you in the first batch to come off my human assembly line.